Houston Federal Credit Union is offering an exciting new service for our members called Financial Counseling Services. This service will offer free, personal, and confidential counseling tailored to members with complex financial situations. HFCU is pleased to introduce Zulika Diaz, our financial counselor, with over a decade of experience. Zulika is a certified credit and housing counselor accredited by National Foundation for Credit Counseling (NFCC). She strongly believes in educating our members on creating a road map that leads to their financial success. 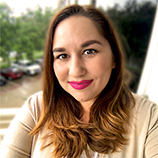 If you have questions or inquiries, call our Financial Counselor, Zulika Diaz directly at (281) 243-0570, or email her at zulikad@houstonfcu.org. Must be a member of Houston Federal Credit Union to receive financial counseling services.